I can't wait to see what she comes up with. Although, I do like the new look you are sporting now. By the way I finally posted about my new pretty. I found you...well I'm not sure how! But I wanted to stop in and visit! How exciting to be getting a makeover and I love the inspiration add! I'm in the process of finding someone to revamp my blog so I'd love it if you'd post her name and website so I can check her out! 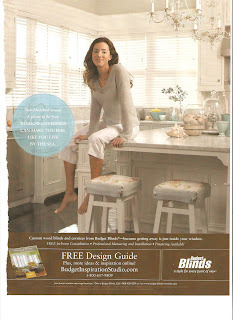 The inspiration I get from the ad is the stools. I like the backless best because you can hide them away completely under the counter. Although, it might not be the best for a 2 year old! Oh I'm so exctited to see it finished! If it turns out anything like the ad's color scheme, which I'm sure it will, it's gonna be just fabulous! Too funny! I saw this add too and put it in my inspiration book because I loved the kitchen and the colors. I can't wait to see the new look :) I do love reading your blog! OOOOoooh, I can't wait to see the new look! I have to say though, you don't give yourself enough credit, Susie girl! That is a beautiful look & I'm sure it will turn out great (but I think you did ok on your own.). i'm loving the pure white look...super fun! Happee Friday, Susie!! I have seen blogs that give me the same feel as that ad does...but I can't remember who they belonged to!! Great look, though! Funny I just talked to Edie who did some graphic work for me about a possible "blog-lift"!! Isn't it so neat to see how everyone's blog evolves as they begin to sense their direction and purpose more fully?? Just love it!! Have a joyful day...I know it will be beautiful and look forward to seeing it when it's done!! I'm so happy you share this picture! I love this kitchen!!!! Can't wait to see what she comes up with! I'm sure it will be great - looking forward to seeing it! It's actually nice as is! I love your inpsiration picture. It is so soft and clean. I can't wait to see your new look. Oh how I envy those talented folks that can do to our blogs what we all love to do to our homes! Looking forward to seeing the remodel job! That is a great inspiration pic...you could just photoshop yourself right into it! :) Can't wait to see what she comes up with! I'm sure the new look will be awesome too, looking forward to it! Beautiful picture. I love those colors. Can't wait to see the magic happen! Can't wait to see the new look. I just found you and I'm already in for a change! Oh can't wait to see it! Great inspiration photo! i know it's going to look great! This is going to be beautiful, Susie. She looks like she's sitting on your island. I can see why you were drawn to this inspiration. It's the sort of look I'd like to see at the back porch. That's why I did the simple grid of room photos at the top. Trying to make it better but afraid to change the template for fear of losing the whole thing and having to start over!! So I decided I'd incorporate the colors of the background, in the banner. Still trying to clean up the sidebar too. I wanted to say that yes the Cold EEZE works. I am taking them now...I started coming down with crud the day before yesterday! yes, the colors are lovely!! Hi Susieness! Oh, how sweet. Now if your blog looks anything like you,it'll be beautiful! Waiting to see the big reveal! I can't wait to see it all finished. I love that picture too! Oh Susie - what fun. I am just finding someone to do mine as well. Can't wait. Who is doing yours? I just love this picture....I'd sit on that island all day long if it was mine as well. I can't wait to see it! I bet it will be beautiful! Can't wait to see the new look. I love the soft crisp colorscheme. ooooh, I can't wait to see what she creates! I love any kind of inspiration! Happy V Day, Susie! Aw! I am honored! I pretty much have a blog crush! I am definitely obsessed with those knobs! You have fantastic taste. Excited to read up on your posts. Can't wait to see what y'all do! I know it will be awesome! Wow! I can see why you chose this photo! It makes me want to "beach up" my whole house! How fun! Here is what I love about that ad...I could never in a million years have that room in my home, because the pristine whiteness and cleanness would be grungy gray in about 6 minutes flat! However, if that look is on your blog then it will forever remain clean and calm and soothing, just as it was meant to be. I love your blog already so can't wait to see what is in store! Awesome! I cant wait to see the new layout! Hey Susie! I think it's great that she is willing to help you. Can you send her my way when she is done?